The United Nations, as well as a number of NGOs, reported this month that more than 12 million people in the east of Africa (particularly in Somalia) have had no access to food whatsoever for several months. This situation is appalling. Many children are dying in this very moment because their families do not have the means to purchase food at current prices, which have risen dramatically. It is unacceptable to attribute this horrible fate to pure chance. While we could blame the particularly violent drought (which caused local agricultural production to drop, hence restricting the availability of certain products at local markets), this is not a reason to ignore humanity’s negligence. We are all collectively responsible for the vulnerable situation in which the majority of the world’s farmers find themselves, whether this vulnerability be related to the climate or to the market. To cite only one example, a very recent report from a panel of high-level experts from the Committee for food Security blames policies and regulations that encourage many countries (including France, the European Union more generally, and the United States) to substitute bio fuels for fossil fuels. As a result of these policies, large stretches of land that were being used to grow food are now being used to grow fuel. Humans also influence price variations by implementing policies that place agricultural products from all over the world in direct competition on the international market. We need a paradigm shift. This is what Robert Levesque calls for after describing the inequitable nature of the currently dominant means of mining and natural resource exploitation. This month, we are featuring his most recent work, “Mother earth: If she was No Longer There for Us.” This book addresses the finite nature of natural resources and encourages us to think of them as a public good on a global scale. It also pushes us to reconsider practices dictated by the desire for short-term profit by addressing the various impacts that they have on the climate, on poverty, hunger, and peace. The international conference “Gardarem the Earth and the Sea,” which took place last month at Nant, explored the stakes raised by our current usage of the earth and its natural resources, and examined economic, political, and legal frameworks in an effort to come up with alternative proposals that address these issues. Meetings of this kind, which bring together representatives of social movements, communities, and researchers from all over the world, are a fruitful way to encourage change through the construction of effective solutions. Here, we present you with a first account of key moments from this conference. In particular, we provide recordings from different thematic meetings, one with José Bové, member of the European Parliament, and Serge Fortier, representing the Committee of Citizens against Shale Gas from the St. Laurent Valley in Quebec. In addition to discussing the degradation of rural and maritime communities, they address the case of “Shale Gas” in France and Quebec. We also provide you with a recording of aGter’s presentation on large scale land grabs and the role of multinational corporations. This said, while it is indispensable to meet in person and discuss these issues for short periods of time, real analysis can only be achieved through in depth exchange. It is necessary to take the needed time to share and comprehend diverse experiences, to confront the ways in which each stakeholder understands and represents the situation, to deconstruct prejudices, and to conceive of joint solutions. These efforts are all the more important because the actors and organizations involved come from a variety of different cultural, social, and disciplinary backgrounds. For aGter, it is exchanges of this kind that most effectively encourage change. To this end, the association has developed a particular methodology, “Research Trips,” which we explored in detail during our last thematic meeting (you can find a video description of this meeting, as well as a film that was made during one of the trips, on aGter’s website). When possible, it produces materials that can be used to diffuse the various analyses and proposals that it has come up with during these trips (see aGter’s most recent contribution to the series of Pedagogic Factsheet: briefing notes to improve our understanding and ability to ask the right questions and take effective action on land matters in West Africa”). In other news, on aGter’s website you can now find a transcription of the most relevant excerpts from a conference with the jurist Monique Chemillier-Gendreau, who we invited to come speak in October 2009 (“Can International Law Contribute to a More Equitable Global Society?”). It is available in both French and English. This conference, which provided much clarification regarding the limits of current international legal frameworks, has contributed largely to aGter’s work. The French, Spanish, and English articles and videos that we present here differ. 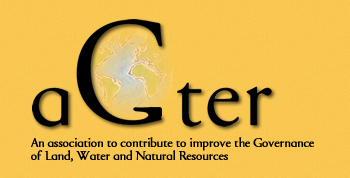 Help us share this newsletter by distributing it to individuals or groups that may be interested in AGTER’s work ! Registration must be completed online, on AGTER’s website, or upon request (speak with or email a salaried member of our team).